Panorama: Taken on Trust is the culmination of a two-year award-winning investigation by Panorama. It has engaged our audience in a very significant way and raises huge questions about the safety of all prescription medicines. It reveals how the medicines regulator, the MHRA, has failed to take seriously patients' concerns about one of the most widely-prescribed antidepressants, Seroxat, and how it has missed crucial safety information about the drug that's been in its archive for over a decade. It all started back in October 2002, we first revealed evidence that Seroxat could cause addiction, aggression and suicide and that it could be harmful to children. Nearly four and a half million people watched that programme and afterwards we received 1,500 emails from viewers and 60,000 calls to the BBC Information Line. However, both the manufacturer of the drug, GlaxoSmithKline, and the regulator dismissed our evidence at the time, as did many of the doctors and psychiatrists who prescribed the drug. Shortly after that programme, the government ordered that an inquiry be set up into the safety of Seroxat and other antidepressants like it. Meanwhile, we read all of our viewers' emails and saw that hundreds of people were - quite independently of each other - recounting similar harrowing tales of their time on Seroxat. We followed up dozens of the emails and made a second programme that was broadcast in May 2003. Many children had contacted us to say they had started self-harming or became suicidal on Seroxat. Still GSK denied our claims. The MHRA refused to take part in the programme. However, a few weeks after that second programme was broadcast, they took the dramatic decision to ban Seroxat for use in under-18s - for exactly the reasons Panorama had been reporting. Our investigation was also instrumental in the FDA's recent decision to force Seroxat to carry a suicide warning for children in the US. In the second programme, we also reported how the information leaflet that accompanies Seroxat (written by GSK and approved by the regulator) was misleading millions of patients. It said "You cannot become addicted to Seroxat" and withdrawal symptoms are "not common". Yet the month after our programme, the addiction claim was removed and the leaflet warned that 1 in 4 patients could expect to suffer withdrawal problems. 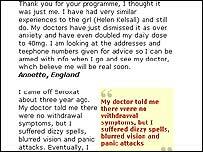 As a result of these programmes, many doctors have now changed their view of Seroxat. One of Britain's most eminent psychiatrists tells this Sunday's programme "The evidence that these tablets can cause suicidal feelings is now absolutely clear". We hear from a whistleblower who has been on the inside of the inquiry into the drug's safety. He's decided to speak out now because he's concerned that the MHRA has failed to protect patients. "I have very little confidence in drugs that have been regulated in the past", he says. What we reveal goes far beyond Seroxat. The President of the Royal College of Psychiatrists tells Panorama, "I think a few years down the line we are going to be talking about this with many more sorts of medication".